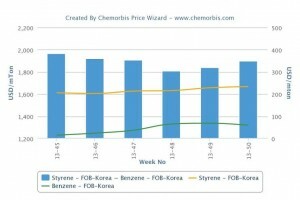 In China and Southeast Asia, import PS prices were driven higher over the past week as sellers lifted their prices, blaming the cost pressure created by firmer spot styrene prices in Asia as per the pricing service of ChemOrbis. Despite the support from the upstream side, global PS demand is not strong as converters are reluctant to stock up in large quantities ahead of the year end and are resisting the recent levels. Nevertheless, some sellers believe that higher prices will eventually be accepted by buyers. 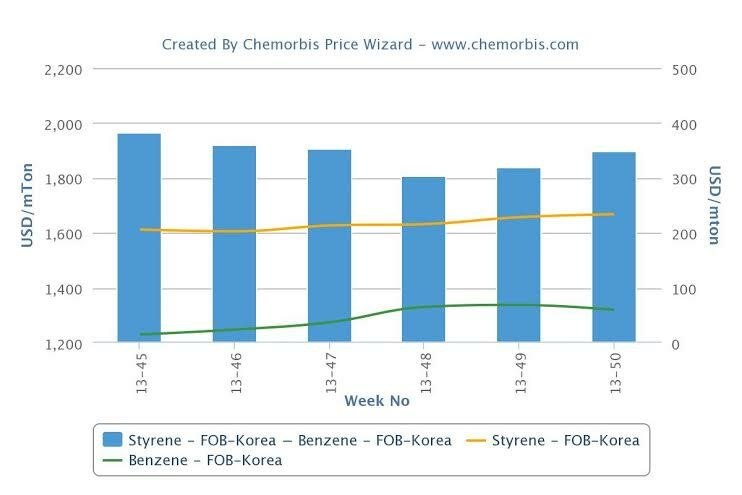 Spot styrene costs have risen by $25/ton on an FOB South Korea basis since December started. The cumulative gain with respect to a month ago totals $75/ton. Meanwhile, spot benzene prices did not change much from early December, while they have posted a $90/ton increase from a month ago. In China, import offers for both dutiable and non-dutiable GPPS origins gained $20-30/ton week over week while HIPS prices inched up $5-10/ton, all on a CFR China/FCA Hong Kong, cash basis. Import PS prices recorded gains in Southeast Asia on sellers’ attempts to reflect rising styrene monomer costs to their offers. Import GPPS prices rose $40/ton on the high end on CIF SEA, cash equivalent basis while HIPS prices gained $10-40/ton with the same terms. A source from a Southeast Asian producer reported, “We increased our offers by $30-$40/ton for both GPPS and HIPS due to firmer feedstock costs and we achieved some deals for small quantities of HIPS at our new levels. In spite of discouraging demand, we feel free from stock pressure as we had sold a good amount of material at our previous price level.” The source expects the market to remain sluggish over the near term since buyers will probably be on a holiday mood by next week. A second Southeast Asian producer lifted their prices by $30/ton following rising styrene prices. According to ChemOrbis, a distributor of a Taiwanese producer reported adjusting his prices upwards by $30/ton, saying they had to reflect the current upstream developments to their customers. “We are feeling pessimistic about the demand outlook as we do not expect to see any improvement in buying interest until after the Chinese New Year Holiday,” the distributor stated.